I am busy getting ready for my next two events. First up is the Tucson Open Studio Tour, this weekend. From 11 a.m. to 5 p.m. both Saturday and Sunday, 167 artists all over Tucson will open their studios to the public. You can download a combination calendar and map guide showing the locations of all the studios at the Tucson Pima Arts Council site or pick one up at various locations around town, such as libraries and galleries. I am taking a short stack to Flux Gallery tomorrow (actually later today), when I staff the gallery. Five of the Flux artists will be opening their studios: me, Maurice Sevigny, and, at the same shared studio, Bryan Crow, Steven Derks, and Peter Eisner. If you want more info, the Arizona Daily Star had an article about the tour in its Sunday paper. If you forgot to get the paper or already recycled it, and you’re willing to register and login, you can read it online at azstarnet.com. The studio tour gives you a chance to see how (or at least, where) your favorite artists work. My studio will, of course, be a lot cleaner than it usually is (although I can never entirely get rid of the sawdust), but you can see my equipment and my wood and learn about my process. You can also see my work, of course, including some in progress, especially pieces I am trying to finish before the following weekend, when . . .
. . . the Tucson Museum of Art holds its annual Holiday Artisans’ Market at the museum (140 N. Main Ave.). The show is open from 10 a.m. until 5 p.m., Friday, Saturday, and Sunday. You can find me in my usual spot, Booth 105, on the east side of the museum, catercorner from Old Town Artisans. This will be my last show of 2009, so after Thanksgiving I will finally get to finish laying the new floors in my house. 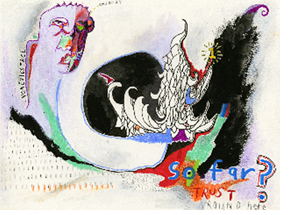 Nine of us Tucson artists have responded to the current economy by banding together and starting a gallery of our own. We’re calling the gallery Flux, to emphasize its changeable, fluctuating, fluid nature, and we have acquired space in Plaza Palomino, at the southeast corner of Swan and Fort Lowell Roads. We have our first show pretty much installed, though we’re still tweaking which pieces are placed where, and we’re preparing for our grand opening on Friday, October 16, 5–9 p.m. There’s a wonderful of variety of work to be seen, and we’re hoping to have a big crowd to help us celebrate. In addition to the art, we’ll have wine, water, appetizers, and music from a string quartet, so please mark your calendars and join us. Carol Ann: After eight years of painting semirealistic expressive watercolors, Carol began to experiment with collage, acrylic, and a more abstract style. 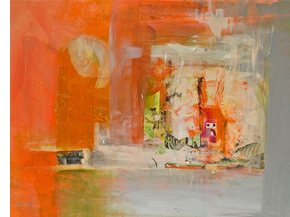 This new nonobjective evocative approach anchors her work and has become her passion. Worldwide travel and the American Southwest, where she lives, continue to be her primary influences and inspiration. She loves the labor-intensive layering of paint and paper as she mines and refines her work to represent the concepts and the heart of the places her paintings represent. Lee Roy Beach: Throughout his forty years as a research psychologist, Lee studied, among other things, the neurological and experiential aspects of visual perception: how the mind creates visual representations of environmental events from partial and unreliable sense data. He found that this act of creation makes the representation both meaningful and compelling to the observer. As a result, he strives to avoid dictating the observer’s experience, providing only enough visual data for the observer to create his or her own artistic experience, thereby inviting participation in the creation of the work itself. The goal is for the observer to have an artistic experience that is both intellectually and emotionally stimulating and that is unique to him or her. He has been painting since the late 1950s but began his art career in the mid-1990s and has exhibited work in numerous shows and galleries. Steven Derks: Finding and collecting curiosities in thrift stores and junkyards is a lifelong preoccupation and a passionate experience for Steven, rather like going to church. Three or four times a month, he visits one of Tucson’s four junkyards. Steven walks around alone, looking at the forlorn piles of bent, twisted and rusted metal lying all over the place. Now things start to happen very fast; everywhere he looks he begins to see metal transformed into finished sculptures. Most of his sculptures are conceived right there in the scrap metal yards, where he finds both the vision and the ingredients for his work. 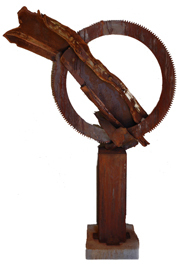 Most of the time, during one visit, he is able to locate all of the actual metal parts that will be necessary to complete many sculptures, but occasionally an exciting piece of rusted metal will languish in his studio yard for months, waiting for the day he will find the piece or pieces that are missing. Karen A. Dombrowski-Sobel: After a 15-year career as a designer in large New York City architectural firms, Karen turned her lifelong hobby of fine art photography into a new profession. That was twenty years ago. Having developed and printed her own black-and-white work for many years, she started selling her work in galleries in New York, the Hamptons, Sag Harbor, and Carmel. In addition, she created fine art portraits for many NYC and Long Island clients. Being a painter early in life, she used those skills first in her hand-painted black-and-white photos and, more recently, in the digital work she creates with Photoshop. She moved to Tucson in 2005, after traveling around the country for a year. 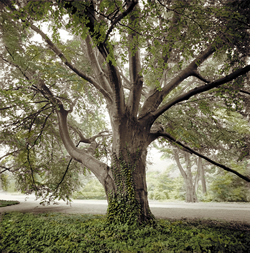 She is concerned with environmental issues, and her recent work centers on the landscape, and trees, in particular. Her wish is to create with her work an intimate relationship between the viewer and the subject, to inspire more thought and care for our wildlife and natural habitat. Peter Eisner: Peter currently has his studio at 801 North Main in Tucson. 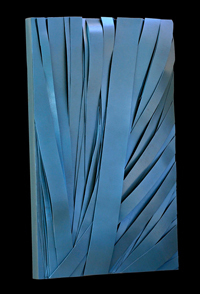 His work includes both freestanding metal sculpture and woven metal wall pieces. Peter’s work is currently being shown in Tucson at Gallery 801, the gallery at the restaurant Elle, Flux Gallery, and Art Marketplace. Maurice Sevigny: Maurice is originally from Massachusetts, where he majored in art education, ceramics, printmaking and painting at the Massachusetts College of Art in Boston. He earned his M.A. and Ph.D. degrees from the Ohio State University. He taught studio art and arts education at Western Kentucky University, then served as the director of the School of Art at Bowling Green University (1977–1986). He was department chair and Marguerite Fairchild Centennial Professor of Art at the University of Texas at Austin (1986–1991). Since 1991, he has lived in Tucson, where he served as dean of the College of Fine Arts at the University of Arizona for 18 years. He did postgraduate studies at Harvard University and completed a summer residency internship in figurative realism and painting at the La Napoulle Foundation, in the south of France. In 1998, he completed a sabbatical teaching and studio art research residency at the Rohampton Institute, London, England. 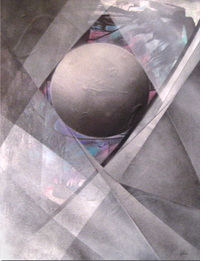 He has exhibited frequently and his paintings are in many private and corporate collections. Shirley Wagner: Born in Youngstown, Ohio, Shirley obtained a Bachelor of Fine Arts degree from Youngstown State University and lived in New York City before moving to Tucson in 1983. She now resides with her husband and three sons in the Tucson desert, about which she says, “What appears at first to be harsh and desolate terrain carefully reveals a partnership of dynamic forces working together to survive. I am inspired to create a living plane to chronicle the harmony of these extremes.” She was a visual arts specialist in Tucson’s public schools before dedicating herself full-time to her wood assemblage work. 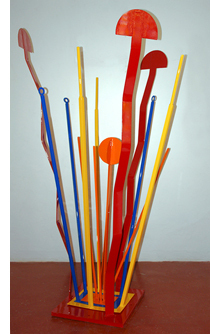 Shirley was nominated for the Arizona Governor’s Art Award in 2006, in recognition of her contribution to the arts. 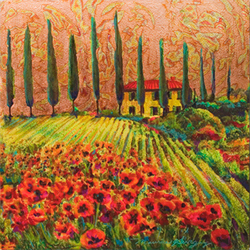 She has been featured in various local publications, including the Arizona Daily Star and Tucson Lifestyle, and her work is in various private collections throughout the United States and Germany. Lynne Yamaguchi (me!—pardon the third person . . .): Seven years ago, acting on a gut feeling, Lynne quit her career as an editor and book designer to become a woodturner—giving notice at her job before she even knew how to turn. Now an internationally known turner, Lynne uses traditional lathe techniques to create nonutilitarian, sculptural vessels that are deeply informed by her Japanese heritage. In 2007, she was a fellow in the International Turning Exchange, an annual eight-week residency sponsored by the Wood Turning Center in Philadelphia. She has demonstrated and taught woodturning techniques across the country and sells her work through galleries and art shows, and online.